A poorly lit trail between residence buildings at Stanford University that's been dubbed the "scary path" is being replaced by a new paved path. The uneven dirt path not far from where former Stanford swimmer Brock Turner sexually assaulted a woman in January 2015, is a highly used route for those on campus. The new path, which is being named the Knoll Path, will be paved and have much better lighting, campus officials said. 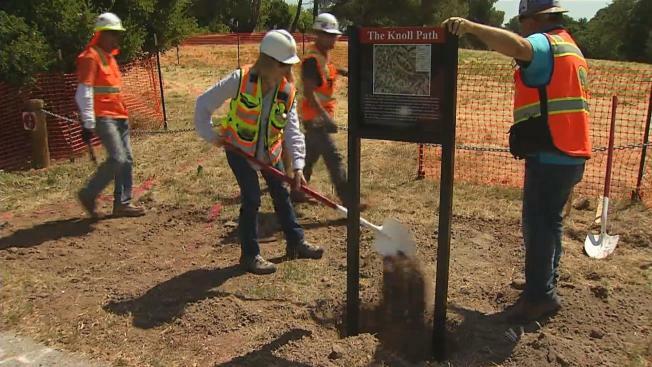 Stanford officials held a groundbreaking ceremony Monday, and construction on the new path began. Those who frequented the "scary path" said they're relieved. "I mean, I've definitely walked on the path at night, and it has been frightening, especially as a female on campus," student Alexis Kallen said. "I think it's a great idea." Stanford officials said they want the area to feel safer. "We're gonna be paving and lighting it, so we hope students use that path instead of this one over here," said Greg Boardman, vice provost for Student Affairs. The new path comes after years of student lobbying for something safer. The university said the path work will continue through the summer, and it should be open by the time students arrive for the new school year in the fall.